Größe dieser Vorschau: 462 × 599 Pixel. Weitere Auflösungen: 185 × 240 Pixel | 370 × 480 Pixel | 463 × 600 Pixel | 592 × 768 Pixel | 790 × 1.024 Pixel | 1.419 × 1.840 Pixel. 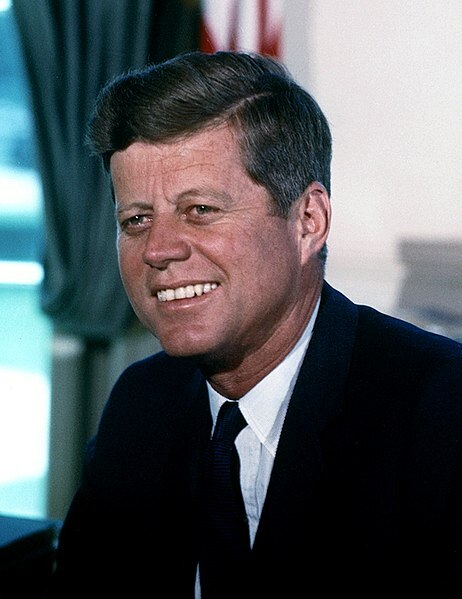 English: John F. Kennedy, photograph in the Oval Office. Français: John F. Kennedy dans le Bureau ovale. Diese Datei ist im Bestand der National Archives and Records Administration verfügbar, katalogisiert unter dem National Archives Identifier (NAID) 194255. 18:49, 13. Jun. 2015 1.419 × 1.840 (1,21 MB) Spartan7W Started from scratch. Took original, cropped to proper size, scaled up. Old file was too heavily worked, color not contemporary, became quite grainy, didn't look good, especially in infoboxes. Now back to original condition. 22:09, 24. Jan. 2015 1.536 × 1.840 (363 KB) Hohum Superior version for colour and cleanup.